Call it a change of Hart. 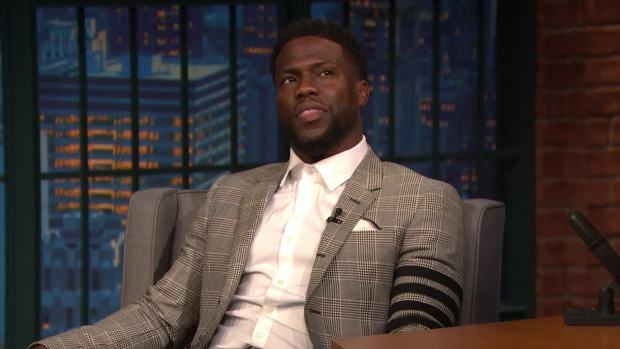 Kevin Hart says he is re-evaluating his decision to step down from hosting the Oscars after fellow comedian Ellen DeGeneres revealed she reached out to the Academy of Motion Picture Arts and Sciences on his behalf and they said they’re still interested in Hart for the job. Hart made the decision last month to pull out as emcee of the show when homophobic comments he made nearly a decade ago resurfaced on social media, sparking a backlash and demanding he apologize or resign. In a preview for Friday’s episode of "The Ellen DeGeneres" show, the talk show host said she called the Academy to urge the organization to rehire Hart and was told the Academy would be “thrilled” to have him host. Hart opened up about his reaction to learning that he would be a hosting the Oscars, becoming one of just a handful of African-Americans to score the gig. But when anti-gay comments he made 10 years ago resurfaced on social less than 24 hours later, Hart said his initial reaction was to ignore it. "I'm a little upset because I know who I am. I know I don't have a homophobic bone in my body," he said. "I know that I've addressed it. I know that I've apologized. I know that within my apologies I've taken 10 years to put my apology to work." Less than 48 hours later, Hart announced he was stepping down because he didn't want to be a distraction and apologized to the LGBTQ community. "The conversation's about Kevin Hart's tweets from 10 years ago and homophobia," he said. "I don't want to step on that stage and make that night about me and my past when you've got people that have worked hard to step on that stage for the first time and receive an award. I'm now taking away from all those moments because the night is focused on something else now. That's how I see it." "I talked to you about all of this and you've already expressed that it's not being educated on the subject, not realizing how dangerous those words are, not realizing how many kids are killed for being gay, or beaten up every day. You have grown, you have apologized, you are apologizing again right now. You've done it. Don't let those people win. Host the Oscars,” DeGeneres said, reiterating her support. Hart told DeGeneres he’d evaluate their conversation and decide whether to take on the job again amid his tweet controversy. The host later tweeted that she believes in "forgiveness," "second chances" and Kevin Hart. Previews of the interview released Thursday were met with mixed reaction as some social media users criticized DeGeneres for her decision to support Hart and "absolve" his past comments by giving him a platform on her show. Ellen’s show is basically the embodiment of respectability politics, so using it as a platform to absolve Kevin Hart on our behalf sounds pretty much on brand. Her sitcom allowed her to do something radical, which she suffered for, & she’s been running away from that ever since. In his past tweets, many that have been deleted but were screen-captured and shared online, Hart wrote about not wanting his son to play with his daughter's dollhouse because "that's gay" and posting that someone resembled a "gay billboard for AIDS." Hart also made homophobic comments in his stand-up routines. In the 2010 special "Seriously Funny," he said, "one of my biggest fears is my son growing up and being gay." Amid the Oscars outcry, Hart wrote on Instagram that critics should "stop being negative" about his earlier anti-gay remarks and said he had grown as a person since he made them. "I'm almost 40 years old. If you don't believe that people change, grow, evolve? I don't know what to tell you," wrote Hart, who added, in all-caps: "I love everybody." It's not the first time an Oscar host has been derailed by anti-gay remarks. Ahead of the 2012 Academy Awards, producer Brett Ratner, who had been paired with host Eddie Murphy, resigned days after using a gay slur at a film screening. Murphy soon after exited, as well. Kevin Hart talks about "Night School,” taking over as principal for a day at a school and how the poor performance of "Soul Plane" at the box-office helped his comedy career. That year, a tried-and-true Oscars veteran — Billy Crystal — jumped in to save the show, hosting for the eighth time. This time, speculation has already been rampant that few in Hollywood want the gig, for which few win glowing reviews. The film academy moved up this year's ceremony to Feb. 24, giving producers little time to find a replacement. The Oscars will air at 8 p.m. ET on ABC.